I tried to go five days without creating any waste. This is what happened. 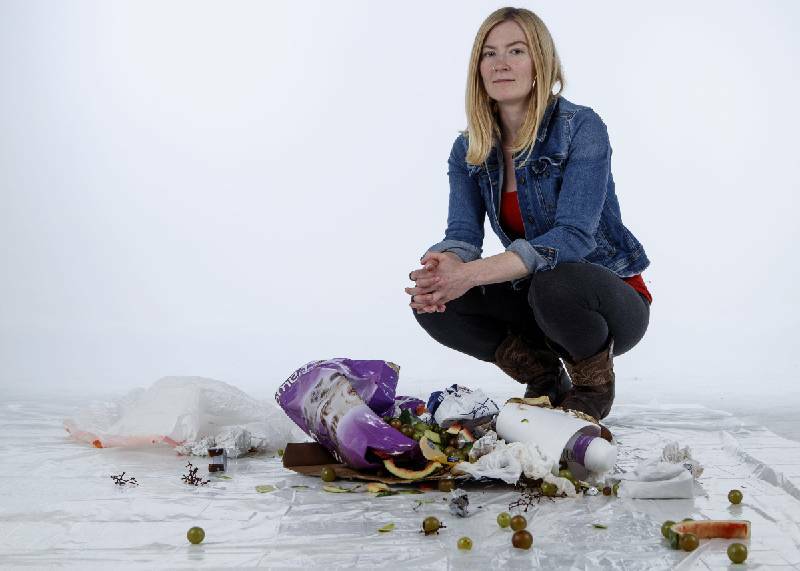 Writer Sunny Montgomery poses with 4 pounds of garbage, which, according to a 2013 EPA report, is the amount of waste generated per person every day in America. As an American adult, every day I generate about 4 pounds of garbage, according to a 2013 EPA report. But that report is wrong. I'm an eco-conscious gal. I recycle. I compost. I remember my canvas tote bags when I grocery shop sometimes. OK, rarely. Still, 4 pounds? That couldn't be right. So I decided to challenge myself. I would try to go five days without generating any trash that would wind up in a landfill. An exercise in waste awareness, if you will. These were the rules: During that time, I could not put any object into a trash can. I could not purchase or procure any object that would eventually go to the landfill. I could recycle or repurpose my waste, but only in earnest. For example, opting for a Styrofoam to-go cup, pretending I'd later craft it into a night light, did not count. And finally, I could not ask another person to toss trash for me. I knew it would require some effort. But what I did not know was, well, a lot. Minutes into day one, I was forced to make my first sacrifice. Bleary-eyed, I stumbled into the bathroom and reached for the cotton balls which I use with toner every morning to clean my face. Cotton, I would soon learn, takes between one and five months to decompose — though likely longer in a landfill. Landfills are not designed to break down waste. Within the 3,091 active landfills in the U.S., trash is packed into mounds and sealed under rubber and clay and over a plastic liner, I read in Live Science's "What Happens in a Landfill." Those barriers prevent the garbage from seeping out — and oxygen and moisture, necessary for decomposition, from getting in. Regardless, the cotton ball was trash. So instead, I splashed my face with water. My next quandary came while preparing breakfast: fried eggs and a sliced peach. The shells and peach pit could be composted, but what about that fruit sticker? 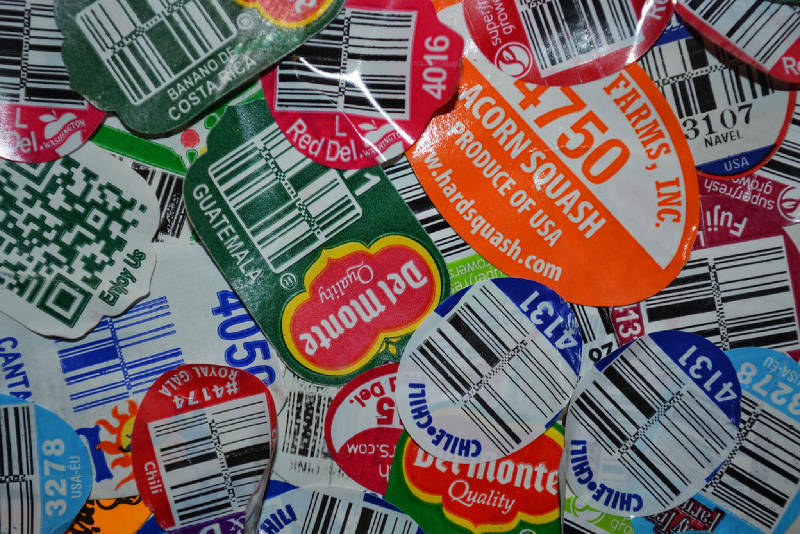 Fruit stickers, I learned, are made using paper, plastic and glue. 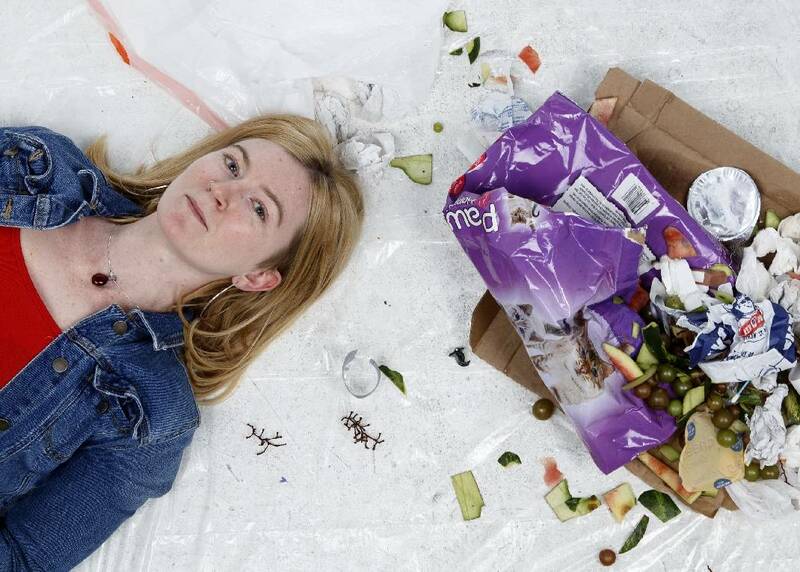 They are not recyclable, compostable or edible, a question that a surprising number of people ask online. The best hope for a fruit sticker is to be repurposed as art, so onto my Nalgene bottle it went. The best way to avoid them altogether? Shop at a farmers market. The next issue arose when I noticed my stick of butter was almost gone, causing me to wonder, from what is butter wrapper even made? Spatula in one hand, smartphone in the other, again I Googled. The answer is silicone-coated parchment paper — not recyclable. However, it can be repurposed into muffin liners, or folded, frozen and later used to grease pans. For me, a baker who rarely plans ahead, this was practical. Coffee, I was relieved to discover, posed no problems — that morning, at least. My pot features a reusable filter, though paper coffee filters are compostable. But that cardboard cup from your local coffee shop? Most (99.75 percent, to be exact) are not recyclable due to a thin plastic lining that cannot be separated from the paper. So bring a travel mug, or commit to crafting that night light. I was prepared to think outside the trash bin when it came to cleaning up after my dog, but I was not prepared for the labor-intensive alternative. DoodyCalls, a company that collects dog droppings across 22 states, estimates that the 78.2 million dogs living in the U.S collectively produce more than 10 million tons of waste each year. The issue with not picking up poop, or with burying it, is that it contains bacteria and potentially parasites, which find their way into groundwater. The EPA recommends flushing it down the commode. 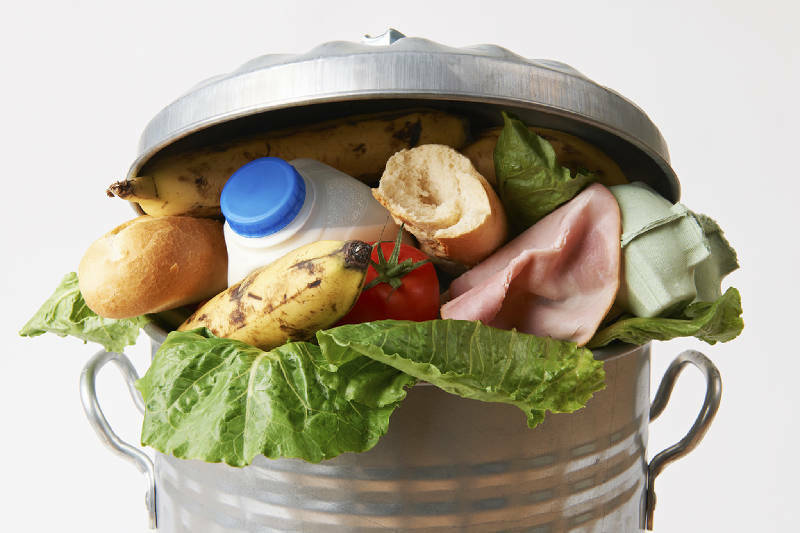 But composting is also an option as long as it's done in a way that destroys any potential pathogens. This requires the right blend of air, water, organic matter and microbes, a recipe that the USDA conveniently provides in its online brochure, "Composting Dog Waste." So for five days, instead of wrapping Red Dog's doo in a plastic bag and tossing it in the trash, whenever we went for walks I would carry a small spade which I used to carry Red's poop back to my compost pit — only a little awkward. I work in a newsroom. For most of my day, I sit at a desk and type, occasionally scrawling reminders, numbers or quotes onto sticky notes — which are recyclable. However, not recyclable? Paper towels. According to Business Insider's "Here's why you should stop trying to recycle your used paper towels" article, paper towels are often made from recycled paper. "By the time the paper's been reincarnated as a napkin or tissue, the fibers are too short to be used again," the story reads. Moreover, The New York Times reports that paper towels comprise 20-40 percent of the waste from an office building. Paper towels can be composted, I learned. But rather than keeping a compost collection on my desk, I thought I would just avoid paper towels altogether. Yet every time I washed my hands, I found myself mindlessly reaching for the paper towels, and, indeed, I had to pack several wads home. The same was true for snacks. Fruit meant packing home peels and cores. But what about a protein bar's plastic wrapper or the plastic bag containing an afternoon snack of mixed nuts? Determining from what materials these products are made was an arduous task. I researched for hours with no definitive answer. The best I could gather is that snack wrappers for everything from protein bars to candy bars to cheese are most likely made from one of two materials: low-density polyethylene or polypropylene. Unable to read one more online article or sift through one more forum, I called Chattanooga's Public Works Department to find out if these plastics are recyclable. Nope, Harry Strickland, general supervisor over curbside recycling, told me. And neither are ironing boards, diapers or grass clippings, he continued. "For some reason, we see a lot of those things curbside," he said. I'd already learned enough from my waste-free week to know that grocery shopping was not going to be as simple as limiting my list to produce and items packaged in recyclable containers. First, there was that fruit sticker business. Then, there was the realization that I had no idea how certain products were made. Fruit and vegetables are compostable, as long as you avoid that fruit sticker and those plastic produce bags, which are made from polyethylene, the same non-recyclable material as snack wrappers and grocery bags. Bread bags, too, are made from that same low-density plastic and cannot be recycled. But they can be reused to pack lunches, collect compost scraps or pack shoes or toiletries for traveling. A salad dressing bottle, or any plastic container, can be recycled as long as its bottom is stamped with a number "1" or "2." But their plastic lids are commonly made from heavier plastic. If they were stamped with a number, it would be a "5," denoting a type of plastic that is often collected curbside, but not in Chattanooga. Milk cartons and fruit juice cartons, though wax-lined, are still recyclable. Of course, I forgot my canvas tote bags and had to carry my loose groceries in my arms, lest I give in to the plastic bag. Plastic bag statistics are somber. 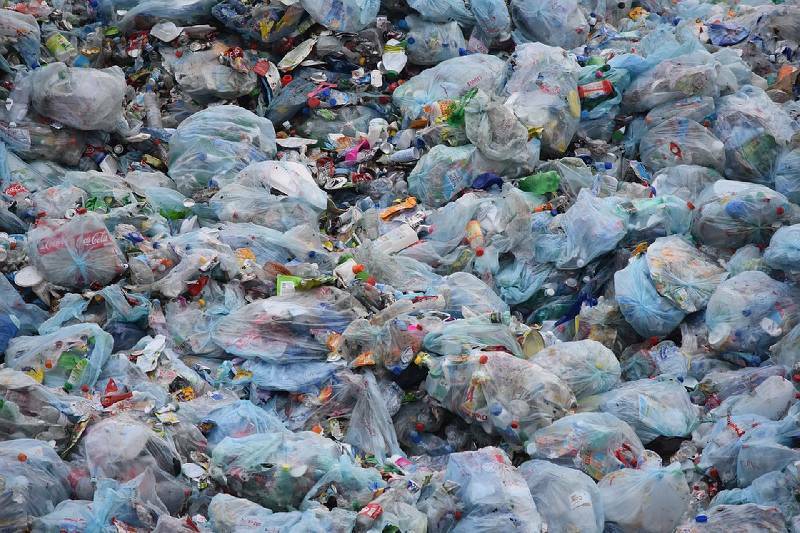 Numbers compiled by Waste Management Company state that Americans use 100 billion plastic bags each year — only 1 percent of which will be returned for recycling. The rest wind up in landfills where they take more than 500 years to decompose. In Chattanooga, the only two plastic bag drop-off centers I found were Publix and Walmart Supercenters. And the good news? These centers also accept produce bags and bread bags. Technically, a receipt can be recycled. However, 94 percent of receipts are made using a chemical called Bisphenol A, or BPA. According to the American Cancer Society, BPA may be harmful to one's health. Consequently, the ACS advises against recycling or composting receipts, which can contaminate other paper products. The more I was learned, it seemed, the less I knew. I had known my challenge would require some effort. I had not known that going waste-free would be the easy part. The hard part was all the in-depth online research to understand how products and packaging are made. According to Frontier Group, an organization dedicated to building a cleaner, healthier America, about 30 percent of all U.S. garbage is packaging. I had never thought so critically about my consumption. It was eye-opening and exhausting. At home that Friday evening, I emptied my overflowing kitchen compost. I started a load of laundry and pulled the clump of lint from the dryer — garbage, I knew, unless, of course, I spun it into thread or turned it into hamster bedding. Instead, I chucked it into the trash can. Every year, Americans produce 230 millions pounds of garbage, more than 30 percent of the total trash generated worldwide. But the onus to waste less, I have now learned, cannot only be on the consumer. Companies must find a way to create more recyclable products with less packaging. Still, we have all contributed to this crisis, one cotton ball, one fruit sticker, one careless clump of lint at a time.